Fermat’s Last Theorem is the most notorious problem in the history of mathematics and surrounding it is one of the greatest stories imaginable. It dominated my own life for four years, because I made a TV documentary, wrote a book and then lectured on the subject. Getting involved in Fermat’s mischievous conundrum set me on the path towards being an author and ignited an interest in mathematics that has continued ever since. As a physicist, I was always interested in mathematics as a tool for studying the universe, but learning about Fermat’s Last Theorem taught me to love mathematics for its own sake. Pythagoras’ Theorem is not just a nice idea, or a notion that seems to work for most right-angled triangles. It is always true and mathematicians can prove this. The numbers (3, 4, 5) or (5, 12, 13) are known as Pythahorean triples, and such triples have been studied for thousands of years. Indeed, ancient Babylonian tablets list Pythagorean triples. There are an infinite number of Pythogorean triples. This can be demonstrated by looking at looking at the difference between successive square numbers. You can see that every odd number is the difference between two squares. Therefore every square odd number is the difference between two squares. There are an infinite number of square odd numbers, so there must be an infinite number of Pythagorean triples. Surprisingly, the Frenchman came to the conclusion that among the infinity of numbers there were none that fitted this new equation, which is said to be cubic or to the third power. Whereas Pythagoras’ equation had many possible solutions, Fermat claimed that his equation was insoluble. xn + yn = zn , where n is any number greater than 2.
or to put it another way..
Fermat believed he could prove his theorem, but he never committed his proof to paper. It is believed that the creation and proof of the Last Theorem happened in about 1637, but it was not until after Fermat’s death in 1665 that his marginal note came to light. His son, Clément-Samuel, discovered the casual jotting along with many others, all hinting at theorems, but at best giving only a glimpse of the underlying proof. Then in 1670 he published Diophantus’ Arithmetica Containing Observations by P. de Fermat, which contained Diophantus’ original text interspersed by Fermat’s notes. Now the race was on to rediscover Fermat’s proof. Trial and error showed that Fermat’s Last Theorem seemed to be true, because nobody could find three whole number solutions. But nobody could be sure that no such solutions existed. 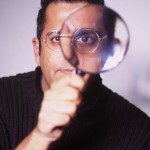 Mathematicians would only be happy if they could find a solid proof, a reasoned argument, something that would unequivocally show that the theorem was true. 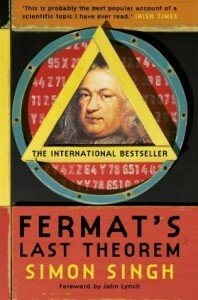 Fermat’s Last Theorem became the most notorious problem in mathematics. The more that mathematicians tried, the more they failed, and the more desirable a solution became. The Last Theorem was a source of frustration, but it also had a lighter side. In the 1980s a piece of graffiti appeared on New York’s Eighth Street subway station. xn + yn = zn , no solutions. but I can’t write it down because my train is coming.